There are some incredible historic sites in Santa Fe, NM, that you will love exploring during your vacation. One of these sites is the Palace of the Governors, a 1610 adobe structure located at the Plaza between Lincoln and Washington Avenues. Originally constructed as Spain’s seat of government, this early 17th-century structure is now a Registered National Historic Landmark and American Treasure. The Palace of the Governors also currently serves as the state’s history museum. Discover more about touring this historic structure and discovering its rich past! For more information on historic landmarks in Santa Fe, you can download our free Vacation Guide. It features some of the best locations to visit during your stay at Four Kachinas Inn, such as the Palace of the Governors. One of the most important landmarks in the Southwest, the Palace of the Governors is one of Santa Fe’s most noteworthy historic sites. This adobe-style architectural gem hails back to 1610 when it was constructed by the newly appointed governor of the Spanish territory that covered most of the current American Southwest. Pedro de Peralta was the original governor, although the seat of government changed hands several times throughout the next few centuries. After the Mexican War of Independence, the Palace of the Governors became New Mexico’s first territorial capitol. In 1909, this historic site became the state history museum. A century later, a new museum was opened adjacent to the palace, allowing for more space. When you decide to visit the Palace of the Governors today, you will discover many enthralling exhibitions and collections. These are located at the adjacent museum New Mexico History Museum. Current and past exhibitions include interesting titles such as Out of the Box: The Art of the Cigar and Lowriders, Hoppers, and Hot Rods: Car Culture of Northern New Mexico. A favorite is the Then and Now Collection, which tells over 500 years of New Mexican stories. You will also find some brilliant Palace of the Governors photo archives. There are over 1 million historic and photographic prints, postcards, negatives, and slides at this location. If you decide to visit the Palace of the Governors during your stay in Santa Fe, free docent tours are available daily. Just call the museum ahead of time to confirm at (505) 476-5100. You can also enjoy a self-guided tour of the Palace of the Governors and adjoining New Mexico History Museum daily. Palace of the Governors hours are 10 a.m. to 5 p.m. daily from May through October. And the price is $12 for non-New Mexico residents. For more information, visit the website! 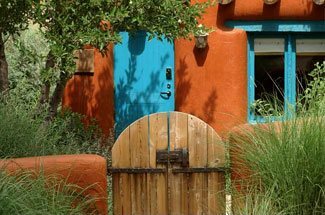 Instead of staying in a chain hotel during your Santa Fe visit, enjoy a more authentic experience at our New Mexican bed and breakfast. The Four Kachinas Inn blends modern luxury with Southwestern charm in the best way imaginable! Enjoy six uniquely decorated rooms, each with their own personality and variety of local artwork. Original Native American, Spanish Colonial, and regional handcrafted furnishings and art are highlighted by traditional New Mexican architecture. 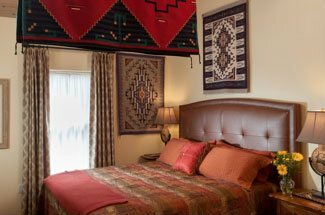 The Four Kachinas Inn will truly give you a taste of the local history and culture. Oh, and our gourmet breakfast isn’t a bad touch, either!